Week two was full of close calls and surprising blowouts. Michigan was creamed by Oregon 39-7, stunning the Big House for the second straight week. If you spread out the Wolverine defense, you are guaranteed at least 400 yards of total offense. Michigan will host Notre Dame next week, who got man-handled by Penn State 31-10. One of these historic powerhouses will start the year 0-3, which is absolutely mind-blowing. LSU, Oklahoma, and Florida rolled, while Ohio State, Wisconsin, West Virginia, and Cal struggled. At least they managed to avoid being upset, unlike Boise State, Auburn, and Georgia. A&M looked to have the game in hand at halftime with a 19-0 lead. However, Fresno outscored A&M 29-10 in the 2nd half, and forced overtime on a miracle 4th and goal touchdown pass. A&M RB Javorski Lane found the end zone twice during overtime, including a 3 yard TD run and a 2 point conversion scamper in the 3 OT that gave the Aggies an 8 point lead. Fresno found the end zone but could not convert their 2 point conversion. Auburn has a strong stable of running backs and a solid defense. However, the offense lacks a strong passing attack, and it really hurt them against a underrated USF team. USF ran the ball 52 times and played solid defense, forcing 5 turnovers. Auburn kicked a 39 yard field goal in overtime, but could not stop USF as QB Matt Grothe hooked up with Jessie Hester, stunning a rambunctious Auburn crowd. Oklahoma cruised putting up an impressive 51 points on a Miami defense that struggled to do anything well all day. Sam Bradford threw a record-tying 5 touchdowns, 3 to star WR Malcolm Kelly. They stifled the Miami offense, holding the Canes to 140 yards. Oklahoma showed that they are the class of the Big 12. Most football fans expected to see a different Michigan team take the field in week 2. I guess we did, because this Michigan squad only scored 7 points. Oregon spread Michigan out and had a field day. 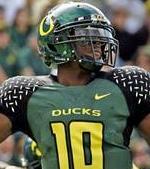 The Ducks dominated Michigan�s weak and pitiful defense, gaining 638 total yards. Michigan could start 0-4 with Notre Dame and Penn State upcoming on the schedule. What a name and a game this kid has. Passmore made some great catches, including a 38 yard touchdown catch, against West Virginia, who was on upset alert until the 3rd quarter. The 6'3" WR never has to verbally complain. He just has to show his coaches the back of his jersey. Tebow was efficient through the air and on the ground against Troy. He completed 18 of 25 passes for 237 yards, 3 touchdowns, and no INTs. He also ran for 83 yards and a score. The freshman QB had a record breaking day. He set a school record with his 5 touchdown passes versus UL-Monroe. He is playing better than anyone could have imagined so far this year. If he keeps playing like this, Clemson is a legit BCS bowl contender. I could have picked any player from the Thursday night Louisville-MTSU game. Although UL won 58-42, I was most impressed by MTSU running back Phillip Tanner. Tanner carried the ball 9 times for 143 yards and 3 touchdowns. The Duck QB sliced up the Michigan defense like a Thanksgiving turkey on Saturday. He threw for 292 yards, and ran for 74. He scored 4 touchdowns, including a gorgeous fake statue of liberty play that was reminiscent of last year�s Fiesta Bowl. Kelly caught 4 balls for 3 touchdowns en route to a 51-13 Sooner win over the Hurricanes. Kelly now has 5 touchdown catches in 2 games. He is making life easy for freshman QB Sam Bradford, who has 8 touchdowns this season. #1. Michigan is down right horrible. Michigan is not just down on their luck, or in a rut. This team stinks. They struggle to move up the field unless Mike Hart is carrying the ball, and the defense is one of the worst in college football. If I was a Michigan fan, I would be throwing up right now. The bigger they are, the harder they fall. Michigan is causing an earthquake right now, and it might send Los Angeles into the Pacific Ocean if they lose to Notre Dame next week. #2. LSU and Oklahoma are just as good as USC. LSU has won its first two games by a combined score of 93-7. The offense is full of play makers and the defense is scary good. I thought it would be impossible to go undefeated in the SEC this year, but LSU is changing my mind. Oklahoma�s win over Miami was very convincing. The offense is strong. Sam Bradford is best QB in the Big 12, and he is only a freshman. They have a stable of running backs, including freshman DeMarco Murray who scored 5 rushing touchdowns last week. OU and LSU are just as good, if not better than USC. #3. The Big 10 and the ACC are the worst BCS conferences. Ohio State, Wisconsin, and Penn State all looked sluggish offensively in winning efforts in week 2. Purdue looks the best out of all the Big Ten teams so far, but they have yet to be tested. The Big Ten will have some great games in conference and might produce an undefeated team, but I think the conference will struggle during the bowl season. The ACC is the weakest BCS conference. Virginia Tech was very disappointing in week 2 as they were shut down by LSU's defense. The game was over halfway through the 1st quarter. Florida State and Maryland looked average in their wins, while Wake Forest really missed QB Riley Skinner in a crushing 20-17 loss to Nebraska. Clemson, Boston College, and Georgia Tech are the only teams that have looked impressive so far this year. I think these are the only 3 teams that have a chance to finish in the top 25. Week 3 does not have a blockbuster matchup, but there are a few difficult tests for some top 25 teams. West Virginia, who struggled with Marshall, will go to Maryland in a Thursday night game that has upset written all over it. Ohio State, who has struggled offensively, travels to unbeaten Washington. Florida will host Tennessee in an intense SEC battle, and this will be Tebow�s first real test. USC should dominate Nebraska, but the game is at Nebraska and USC is coming off a bye week. Boston College and Georgia Tech will get together, and the winner should be the favorite to win the Atlantic Division. Lots of points will be scored when Louisville meets with rival Kentucky, while Arkansas will try to hand Nick Saban his first loss at Alabama. Lastly, Notre Dame and Michigan will play in the battle of the winless. Can games still end in ties?